When we spoke to Coast Modern a few months ago, it didn’t take a long time to figure out that they were all about feeling good and self-discovery. Their music is alive and fluorescent, sunny melodies combined with lyrics which at first might seem simple but, if pondered upon, reveal themselves as deep and illuminating. It seems only fitting that their debut album, Coast Modern, out today via 300/+1 Records, is released in the middle of summer – there’s no better time to get to know the ins and outs of the California duo. Fresh off Alt Nation’s Advanced Placement tour with Missio, 888, and Sundara Karma, they put out a mixtape in April and have now released their debut album, and are also going to embark on their first North American headlining tour this fall. 2017 has been quite the year for Luke Atlas and Coleman Trapp. Atwood Magazine recently caught up with Luke ahead of their album release to talk about how the year has been going so far and to dive deep into their debut, a genre-bending, deliciously weird, 18-track album. We hope you enjoy the trip into their psychedelic, eerie galaxy as much as we did. Atwood Magazine: We talked only a few months ago and yet so much has happened in the time being! How have you been? Coast Modern: It’s been amazing. We’ve just put the finishing touches on the album a few months ago and are making creative stuff like crazy. You were also on tour earlier this year. How was that? Coast Modern: That was amazing. Insane shows, super packed and crazy kids, like a whole tour like that. It was good, good vibes. You recently released a mixtape, Dreamland 2020, could you tell me more about it? Coast Modern: We make so much music, stuff that might not exactly fit with the album sound or is just us exploring sonic territories. We just make all kinds of music, so this is our way of getting some of that out there, taking the load off. There are so many songs that aren’t out there, we just want to get something out. We finished that in the tour van on the road, and just put it up on 4/20 as a gift. Why did you choose this title for it? Coast Modern: It just came to us. It’s kind of an alternate world, different sound, different collaborations. You’re about to release your debut album, congratulations! How are you feeling? Coast Modern: Thank you! We’re super excited, it’s been quite a long time in the making and it’s really fun to see people’s reactions, they’re freaking out it looks like online. And you postponed your album release from May 5th to July 28th. What did you feel was missing from it, or why did you think that extra time was necessary? Coast Modern: We felt like we wanted to add another song or two and we had those kind of brewing, and we re-worked an older song with a great producer and that ended up being “Dive”. We also added interludes. We thought “we’re not quite ready and want to beef it up a little bit more”. I’m excited, now it’ll be out in the middle of the summer which is a great time for the album. What can we learn about Coast Modern on the album that we hadn’t learned in the singles? 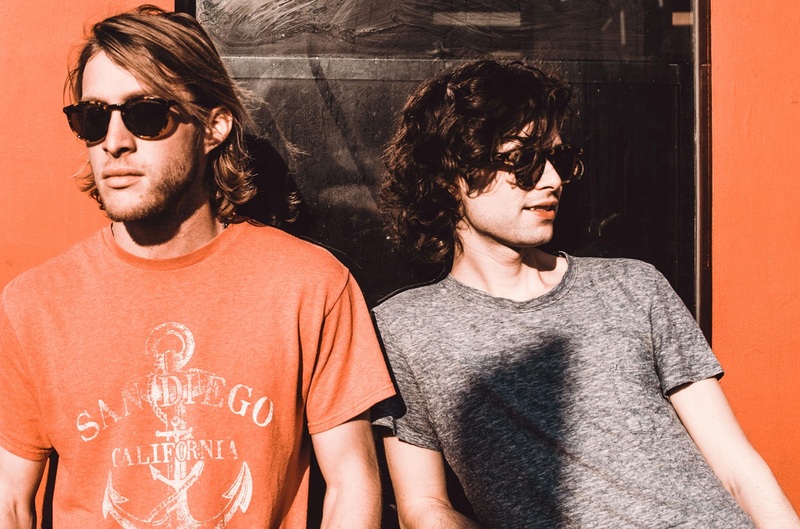 Coast Modern: I think you see a little bit more of the chiller or introspective side in the more acoustic, chilled out tracks like “Wild Things”. There’s also some goofier, weirder side with the interludes and “Pogs and Slammers” – one of our favourites just because we were just messing around in the studio – we’re showing our process in a way with those interludes because they’re totally rough, unfinished. They probably never should have seen the light of day but we wanted to let people in on who’s making this music and where it comes from, it’s an inspiration to see the rough bit. The album’s 18 tracks long - that’s quite lengthy and unusual, but a bold statement. Why did you choose to make it so long? Coast Modern: (laughs) Partially it’s because of the singles that are out already, we wanted to make sure there was some extra stuff that people are getting. But also it’s such a streaming world, people are putting out playlists and stuff, so it doesn’t seem like such a big deal to have a bunch of songs. Our album kind of feels like a playlist, it goes to a lot of different territories. “Going Down” starts the album with the sound of waves on the beach, almost like you’re trying to send us somewhere, and when we talked previously you said each of your songs were worlds. If so, then your album can be considered a system or a galaxy. What does the galaxy you tried to create with this album look like? Coast Modern: That’s really cool! Wow… (laughs) that’s crazy. I think it’s kind of a psychedelic jungle and you’re just kind of wondering through, there are crazy neon plants on the side and that might be a song or two, and you fall in a tree hole and it takes you to the other side like Stranger Things. I’m just wondering, you never know quite what to expect. Any other living beings in this galaxy/planet/world? Coast Modern: Oh wow (laughs) I don’t know… I’m picturing these weird creatures from Splash Mountain on Disneyland, these psychedelic forest creatures, animatronics. It’s actually very eerie and nice at the same time because they’re cute animals but with a little twist. On “Tiny Umbrellas” you sing “I’ll mix a little bit of this with a little bit of that” - if you had to define your album as the mixture two ingredients, what would they be? Coast Modern: Woah. Acid in one part and essence of good vibes. Mixed with kombucha. Coast Modern: Well. Coleman collects obscure cassette tapes. On one of the tapes, the kid’s recording himself, probably just at home and doing stuff, that’s where “Yemma” came from. It resonated with us because we had an inside joke about a video of a girl making a yoghurt parfait and she says “yemma” like “yummy”, so it came from the video and the yoghurt which is the classic YouTube video. It became a big thing in the band, so it’s a weird coincidence that those kids all said it. I’m very intrigued by “Bugs” - it’s interesting because it’s on the final stretch of the album and you think you know where you’re at, but all of a sudden everything just stops and all you hear are bug sounds. Why did you choose to include this interlude? Coast Modern: I mean, what’s better than a little bit of nature? Ten thousand tiny violins? It helps put you in the mindset to be ready to be sucked into the world of “Frost” which is a lot more analogue and was recorded in cassette in Colorado. Hopefully the little crickets take your brain there. “Frost” closes the album and is a song that sounds different to everything Coast Modern has ever released. It’s mellow, acoustic, and stripped back. Is this a possible indication of where you’re heading towards next with your sound? Coast Modern: It’s actually always been around, that song is from before Coast Modern but it’s symbolic because it was kind of the very genesis of this project. Coleman sent me it when he’d retreated to Denver, he just sent me that and I didn’t know where he’d gone or what he was doing, he just disappeared, and then that song shows up and I’m like “Wow, this is so different, it’s so raw”, it was recorded on cassette in a basement somewhere. And that kind of started the mindset of “we could do our own thing, we could start our own project”. What the project turned out to be is a lot different, more electronic and pop-y, but this is symbolic of that freedom. It felt fitting to include the actual demo on the end track. We tried to re-record it many, many times but the initial version has so much vibe, we had to include. I love that on the album we get to see your music infused with different genres - “Going Down” gives me a rock-leaning vibe, “Honeybee” sounds a bit folk and country at times. Who were you listening to when you wrote the album? Coast Modern: Oh man. We listen to so much, I listen to a lot to this one Paul McCartney album, it’s his second solo album called Ram, it’s just whacky, he went off and had fun, and that was a big inspiration sonically and vibe-wise. Anything goes and it takes a lot of turns. We kind of listen to everything, from pop radio to hip hop, to folkier stuff. Part of that influence of different styles comes from when we were working as songwriters, we showed appreciation for a lot of different music. A lot of what we were listening to when we started the group was reggae and reggae disco, which is a unique subgenre, but the grooviness of that and the beats were so different. It’s kind of a sonic soup. You’re about to go on your first headlining tour - what can your fans expect from it? Coast Modern: Oh man it’s going to be a wild, sweaty time. I think we’re going to play a little more with some theatrical elements, breaking down the wall between artist and audience, we want to merge into one big amoeba. We’re excited. Last time we talked, you talked a lot about philosophy and metaphysics. Do you have any philosophical words for your fans before the album comes out? Coast Modern: Wow. I hope that they hear this album and are inspired to get in touch with themselves. There’s so much distraction, and hopefully in the album where we’re exploring what it means to be alive and work on yourself and also where the ideas came from, which feels like a place beyond ourselves. It’s not about our ego, we’re the artists but these are just ideas we’re putting out there. Hopefully people can pick up on that some of that vibe and use that to make their own art. That’s what I’d love to see.